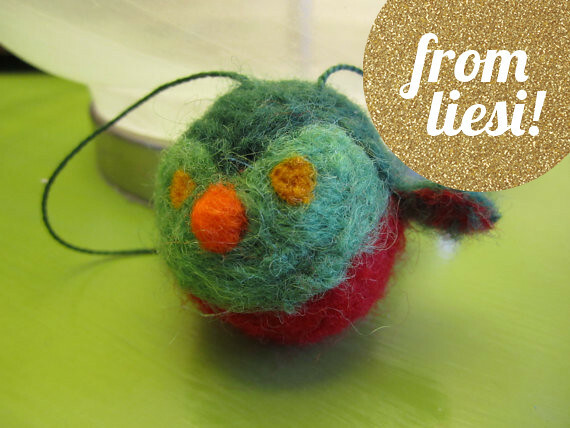 We've been making ornaments for two weeks here on Wild Olive, and there's still one more week of ornaments coming! Does it feel too late for that? Maybe. But there are still those people and presents that could use something last minute. And then of course, you could keep making things through New Year's, and have them ready for next year! A few of my sponsors have some ornaments that they've made, and they want to share! In this post, the ornaments are for giving away, as in...you could win! 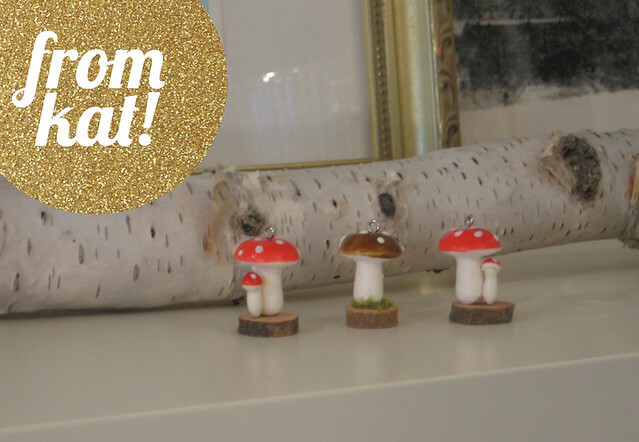 Kat from Cheshire Kat has been making some cute little mushroom ornaments, and a set of three is up for grabs! They are also available in her shop, and you can save 10% with the discount code OLIVE. 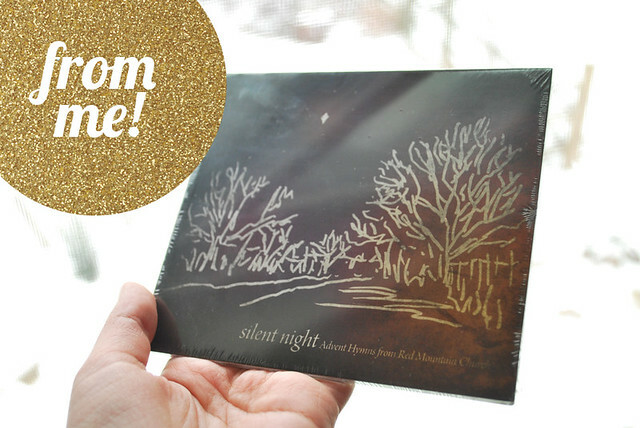 And just for fun, even though it's not an ornament, I'm throwing in a Christmas CD that I've been enjoying this season! One winner will receive all three items (quite possibly after Christmas, because...well...it just might happen that way). To enter, just leave a comment telling us something Christmas-y that you've made (recently or a long time ago!). I'll choose and announce the winner on Monday! Hmm.. Something Christmas-y? Well, I've handmade my Christmas cards for this year. I think they turned out pretty spiffy! I'm making a photo quilt for my father-in-law. Both his parents passed within a few months of each other and now that emotions are less raw, I want him to have a nice way of remembering the good times. That CD is particularly exciting! i just made a knitted santa claus and mrs. claus to add to my decorations! they are SO CUTE! i just finished them a couple of days ago... purelyhandmade.blogspot.com. i've been enjoying each day of christmas ornaments! i'm planning on making a few of those. you're awesome! I made a huge batch of peppermint bark yesterday - mmmmm yummy! I'm trying to finish some superhero ornaments but I keep getting distracted with other responsibilities. I'm hoping to get them finished soon, though! Well I embroidered our stockings, I am making a lot of my Christmas gifts this year and starting Tuesday I will bake for 3-4 straight days! I enjoy making Christmas treats (to give and eat), often with my grand children who love to cut shapes in biscuit dough and lick the icing spoon. I made my son an elf. He has called him hotsy and he watches over him to make sure he has been good. I crocheted him and my son loves him. Just to see his face when he sees him every morning is more than enough for the time I spent making him. I helped my mom make about 30 sets of Swarovski crystal angel earrings as gifts for her friends. She has trouble forming the loops (not that I'm much better), so she arranged the beads on the head pins, and I attached them to the ear wires. After 60 loops, my skills were a bit better, and the earrings were adorable (and a pair made its way into my stocking...). I am frantically working to finish a Christmas quilt this week! My kids and I always make something Christmas-y together every year too, like ornaments or part of a Christmas village. I love it! We had our first little grandchild this year so this is her first Christmas. The most recent Christmas item I made was for her. I made her first Christmas card which was sent to her at our son's new home. I made it from black card paper and I had one lovely gold reindeer cutout outside and one inside like they are flying. I put handcut little snow flakes all over the front and inside and handcut letters inside with a special message just for her first Christmas. On the front I had some metal letter which I glittered in lovely german glass glitter that spelled her name. Our daughter-in-law was so thrilled she cried. She has been compiling a memory book for Quinn-Estelle and she says this is the star of the Christmas section. I made a quilted tree skirt for my MIL last month for her to use this year. She's made tree skirts for each of hers kids but has been using the dame tattered felt one herself for 30 years. It was so time. I have made mug rugs, owls, stockings and an now working on crochet washcloths. I make around 70 Christmas cards every year. I made a sweet holiday table runner for my mother in law this year. Thanks! I personalized a stocking for my grandson with is name on it. I usually make most of my gifts, so don't do a lot of Christmas things. I did make a tree skirt and stockings quite awhile ago. I made 31 beaded net ornament covers for my family and friends gathering on Sat. Thanks for all the great ornament ideas! Thank you for the chance!!! I made Christmas themed dog ties for my pooches to celebrate in. Those little mushrooms are so cute! I'm too late but thought I would contribute anyway..my daughter and I recently made christmas decorations garlands, christmas trees, reindeers and cards...lots of fun! I've just discovered needle-felting, so I've been playing with roving and creating new ornaments from it. So fun!